With the temps in the mid-upper 90s, it is time to embrace my no-fail Waterproof Makeup! Waterproof makeup is essential this time of year. Many days I do end up either at the pool or doing water activities with the kids in the back yard. I often do not know how my day will play out. So, I always opt for as much waterproof makeup as possible. Plus, in this heat, Waterproof makeup is much more resistant to sweat and general makeup "melt-down"! Overall, my makeup look is very simplified (and even more so in the Summertime when I honestly just couldn't be bothered with a fussy look). So, I keep it streamlined: concealer (for under eye area and concealer or a good coverage foundation to dab over slight redness on chin and around nose area), a dab of powder, mascara, maybe eyeshadow (just a wash of color on the lids if I do), lipbalm or sheer lip gloss, and a bit of blush or bronzer applied as blush for color. If I am getting "fancy", I will do eyeliner, too. 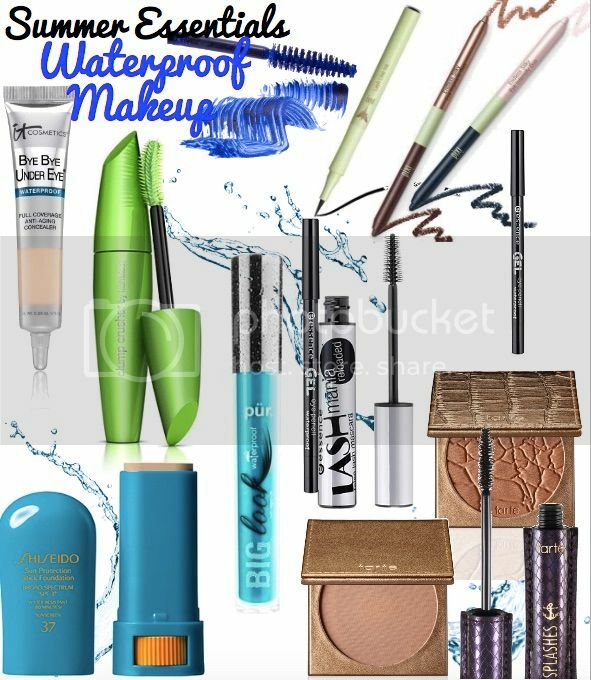 I have a nice little assortment of waterproof and longwearing makeup options in my makeup collection right now. So, I am going to share some of my favorite picks with you today! It Cosmetics | Bye Bye Under Eye Waterproof: How amazing is it that my favorite concealer by It Cosmetics is also available in an waterproof formula?!?! This pleases me to no end! The coverage is amazing and the pigmentation is fabulous. The shade "Light" works very well with my fair skin tone. I just love that I can cover my super dark under eye circles in a waterproof way! Even if I wear no other make, I don't leave the house without concealing those bad dark circles! tarte | lights, camera, splashes™waterproof mascara: This mascara gives my lashes everything that I crave (length, curl, and volume) while also being waterproof! No smudges with this mascara! tarte | Amazonian clay waterproof bronzer (in both matte and shimmer finishes): Waterproof bronzers? Yes, please! I wear high SPF on my face. However, I do still crave that sunkissed glow and can get that with these tarte bronzers! I am especially in love with the matte one! Beautiful! Shiseido | UV Protective Stick Foundation SPF 37: This is a long-lasting water resistant foundation with a creamy feel and medium coverage. This is great for covering slight redness around my nose and on my chin. This foundation is very convenient for travel or on-the-go touch ups because of the slim and portable size. This doesn't budge until I take it off! It comes in four shades. I am the shade Fair Ivory. Pixi | Endless Silky Eye Intensity Duo and Lash Line Ink: Pixi sure does know have a nice selection of waterproof liners! Right now, I am especially loving the Silky Eye Intensity Duo in the Blue Eye Intensity Shade. It is a no-smudge dual ended eyeliner with a deep matte blue grey liner on one side and a brightening opal beige on the other side. I line my upper lash line with the blue grey and brighten up my inner corner and lower waterline with the beige. It is super easy to apply and very flattering for my blue eyes! If I want more of a "liquid liner" look, I reach for Pixi's Lash Line Ink which I have loved for years! It quickly lays down dark color and it doesn't budge. The tip makes it very easy to use and is a great product to get that winged liner look. COVERGIRL | Clump Crusher by LashBlast Mascara: I know, I just can't stop talking about Clump Crusher! It is my all-time favorite mascara. If you haven't already, you really must explore COVERGIRL's mascaras. I am quite a fan of pretty much all of the LashBlast mascaras. Clump Crusher is water resistant, doesn't smudge, and defines my lashes beautifully with no clumps. Plus, the green tube is pretty darn cute! PurMinerals | Big Look Waterproof Mascara: I love this new mascara from PurMinerals! This mascara gives beautiful fullness and length to my lashes. The waterproof formula is great for Summer! essence | Lash Mania Reloaded Waterproof False Lash Mascara: If you are looking for a good budget mascara, be sure to check this one out! For only $4.99, it is a steal and it leaves my lashes super dark black and full. essence | Gel Eye Pencil: I have long been a fan of essence's eye liners. They are so cheap and honestly so good! These glide on and lay down nice dark color. For only $2.99 each, you can afford to indulge in a variety of fun colors for Summer!